We are winning – but it’s not quite over! This year, PM Jacinda Ardern’s government put their money where their mouth is and banned future oil and gas permits. A great start, but it’s not enough. Current permits in our southern ocean have not been banned, and two major oil companies, NZ Oil & Gas and OMV (which bought Shell’s permit this year) are still considering drilling in the Canterbury and Great South Basins this summer. Scientists tell us we can’t burn most of the coal, oil and gas already discovered and keep below two degrees of global warming. We know that if we are to win this race against time to protect a liveable future, we cannot afford to explore for any more new oil and gas. It’s time for the oil companies to get this too. If the government isn’t going to stop them, we will. Please join us as we peacefully draw our human line in the sand to say NO to more oil and gas drilling and YES to a clean renewable energy future. PS: “Hands Across the Sand” began in 2010 after the Gulf of Mexico Deepwater Horizon disaster and quickly grew into the biggest protest against offshore oil and gas drilling in the world, with over 40 countries participating. Oil Free Otago have joined this event since 2012 when we first began opposing deep sea drilling in our precious Southern Ocean. Let’s kick it to touch this time! Like Oil Free Otago on Facebook. What will Dunedin look like in ten years? How about a fossil free Dunedin with safe cycleways, warm affordable homes, cooperative working spaces – or worker owned cooperative businesses! How about a Dunedin-style ‘Cuba Street’ pedestrian precinct in the middle of our beautifully restored Victorian district? …Or do we burden future ratepayers with more debt and $20 million bridges? Oil Free Otago and 350 Dunedin made the following joint submission to the DCC Ten Year Plan. We hope you will find a moment in the next few days to make one too. Oil Free Otago is a group of Dunedin citizens who oppose deep sea drilling off our Coast. Instead we support Dunedin’s just transition to a low carbon economy. 350 Dunedin is part of the international climate movement 350.org. We engage individuals, communities, businesses and governments around climate change solutions through grassroots collective action. Thank you for the opportunity to contribute to the DCC Ten Year Plan. We wish to speak to our submission. Every decision this council makes from here on in must be made with this question in mind: will this help our city mitigate and adapt to our new climate changed world? We are in for huge economic upheaval as the world attempts to decarbonise. We need to rethink our economy, the way we travel, produce food, manufacture and trade. There is no time to waste. You, as the elected representatives of Dunedin, are at the forefront of the most important time in our history, because climate change is threatening to destabilise everything we think of as familiar. You must put climate change front and centre of the 10 Year Plan. In terms of mitigation, we applaud the DCC divestment of the Waipouri fund from fossil fuel exploration. We support your strong stand against the previous government’s Block Offers for oil and gas exploration permits. We urge you to continue your opposition of fossil fuel exploration in our region. We strongly urge you to continue this legacy by now defunding and de-sponsoring from fossil fuels. Fossil fuel companies attempt to gain a foothold and try to build social licence by funding research and other projects in cities where they see there may be a strategic advantage for them. For example, NZ Oil & Gas currently fund the Dunedin Cosy Homes Trust, of which Mayor Cull is chair. This is contrary to his participation in the Global Covenant of Mayors. 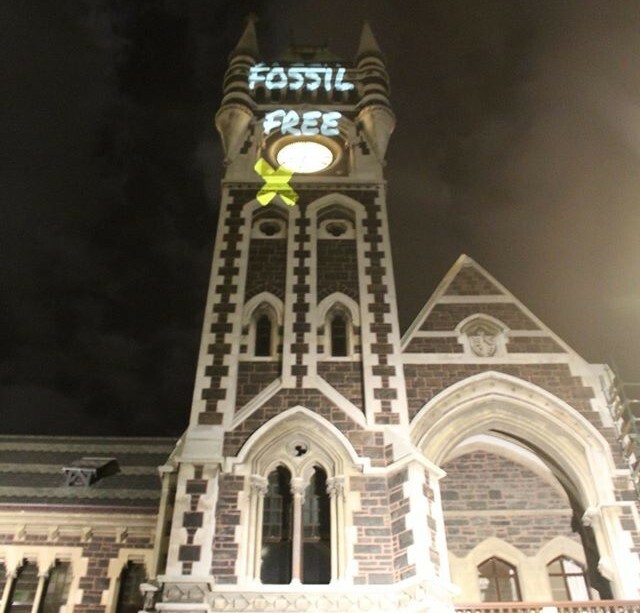 Oil Free Otago and 350 Dunedin urge the DCC to find another sponsor and funder for this and any other project that accepts money from fossil fuel companies. It is time to take a moral stand against the fossil fuel industry. We also urge the Council to not allow future oil conferences to be held in Dunedin’s council-owned venues. Dunedin, in ten years, could be a place where everyone has a healthy and affordable place to live, enough (mainly local) food to eat and meaningful work. It could be a place where our children choose to live, work and raise our grandchildren. Where they can walk, cycle or take public transport to get to work, learn and play. It will need to be a city approaching net zero emissions, with an efficient organic waste recycling industry, job opportunities in low cost timber eco-house building, public and private transport industries, building retrofits, solar and other renewable energy industries. The central city, including hospital and university, could be heated entirely with renewable electricity from a flourishing City Forests waste wood industry. Dunedin will be coal free. Our transport fleet will be fully electric and we could lead the country in our electric vehicle conversion industry. Future and current Dunedin ratepayers will be grateful that ten years earlier, our elected city councillors – you – resisted the temptation of a cosmetic spendup designed to attract rich developers and instead had the foresight to prepare for a climate-changed future. Instead of leaving our children and their generation with more debt to accompany stronger storm surges, sea level rise, coastal erosion, increased risk of drought, floods and wildfires, you focused on how to prepare this city for those events. In the process, you subsidised cheap or free public transport, helped kick-start low carbon manufacturing, worker owned cooperatives, local currency and other initiatives so that money stopped leaking out of our local economy and stayed where it was needed. You continued the great work of restoring Dunedin’s ‘Victorian’ quarter, making Lower Stuart St, Vogel Street and the Octagon wheelchair friendly pedestrian precincts where locals and tourists mix and enjoy Dunedin art, music and cafe culture. All of these things can be achieved alongside a concerted effort to reduce inequality and make Dunedin a city where all citizens feel a sense of community. That sense of community comes from belonging, knowing your neighbours and doing things together. It comes from eliminating the social divide between the haves and the have-nots. It does not come from burdening the next generation with unaffordable debt. We do not support the Council’s preferred option of an architectural bridge. Instead we support separate cycleways and wheelchair friendly linked pedestrian thoroughfares – these may include a modest bridge which could be heritage-style in keeping with surrounding restoration work, while still being affordable. We have no time to waste – we have a city to protect from climate change. We support investment in the central city if this includes wheelchair-friendly pedestrianising of Lower Stuart Street and other heritage streets as suggested. And – let’s not borrow more to do this. Instead of the Council’s preferred option of substantial investment in the tertiary area we support ending slum accommodation for students. That will include an official Warrant of Fitness for landlords and a cap on rent rises. No more price gouging by greedy landlords. Support and encourage good landlords. We support the DCC taking back the buses from ORC and trialing free bus services from South Dunedin and other lower socioeconomic suburbs into the city. This will help to reduce both pollution and inequality. Other cities around the world provide some free public transport including Melborne, Adelaide, Brisbane and Perth. Five cities across western Germany, including Bonn, Essen and Mannheim, will install free public transport by the end of this year, to help reduce pollution. Los Angeles provides a free electric car share system in its poorer suburbs. We support the progressive rollout of e-charging stations for electric bikes and vehicles across the city. We urge increased Council investment, support and engagement in South Dunedin and other more vulnerable parts of the city. We support a moderate progressive rates rise for those who can afford it. They should be related to households’ disposable income. No to more debt. It is borrowing from our kids. Don’t sell off our assets. They belong to the next generation of ratepayers.